I like books that make me rant. Books that have really fulfilled this in the past include Naomi Klein’s No Logo and The Beauty Myth, various other feminist texts, The Undercover Economist, and so on. This book covers some of my favourite things to rant about – materialism, advertising, what’s wrong with society, Americanisation of society, etc. James is convincing (probably even more so if you read the companion volume which contains all the citations and science bit) – he suggests that “selfish capitalist” society in the English-speaking world has given us phoney values which mean that we are forever striving for more, keeping up with the Jones’s etc. He examines this through work, education, relationships, childcare etc, looking at how affluenza strikes across the world and the extent of the harm it does in causing “emotional distress” or depression, mental health problems, insecurity, etc. Basically he’s saying, if we did things for “intrinsic reasons” – because we love to – and if we concentrate on our needs rather than wants (ie we need food; we want a new DVD player) we’d be much happier. He’s right, I think; but there are areas I struggle with, such as identifying oneself with one’s work, which I know I absolutely do, but not for money (who’d be an academic for the money?!) I certainly put my work above most other things in my life, and I still maintain that’s not always a bad thing. Also I think he can be a little sexist, and am concerned by his blaming feminism for some social ills such as women’s desire to work rather than look after children in Danish society. James discusses what he calls the “marketing character” – someone else who sees him or herself as a commodity, and permits society to see them as such; someone whose self is constantly marketed, through the cult of “personality”, cultivating characteristics which make them appear to be the person they have been persuaded they would like to be, and so on. This book seems to be somewhere between social criticism, anthropology, psychology and self-help. He uses “case studies” – anecdotes about people he has interviewed – to make his points, which works in a kind of pop-psychology way, but makes me a little wary of his style and also his purpose. 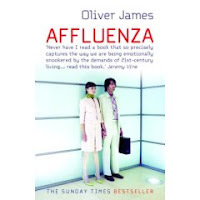 After each chapter outlining society’s problems, he suggests “vaccines” against the “Affluenza virus”, which is where it begins to seem like self-help, though as a general idea rather than to fix what you perceive to be wrong in your own life, it does stand up to scrutiny, just about. Towards the end he becomes increasingly political, ranting against New Labour (which I’m happy to agree with…) and suggesting how an alternative society might operate – very Utopian. Interesting book, though – made me think and caused me to rant again!